These non-functional pumps add detail to your locomotive without the complexity of building and maintaining a functional steam pump. These castings are from the original designs of the 1930s, by Laverne Langworthy and H.J. Coventry. Ribs are cast on the rear, for attaching your pump to a bracket or running board. 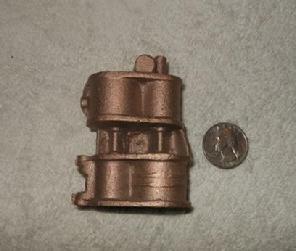 3/4" scale "dummy" (non functional) air compressor by Laverne Langworthy. Sand cast in bronze. $45 plus $10 shipping to the USA, or plus $25 shipping to Canada. For other countries, please inquire. 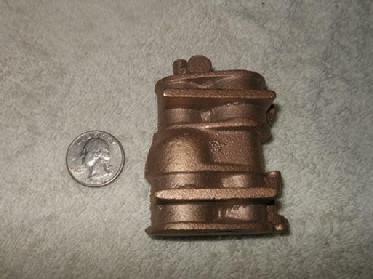 The rear of the "dummy" compressor casting features cast-on ribs for mounting to a bracket or a running board. Please click the Paypal button at right for USA shipping. Canada shipping may be seen below. For other countries, or for payment by means other than Paypal, please inquire. Please click the Paypal button at left for shipment to Canada. (For USA shipping, please scroll "up"). For other countries, or to pay by means other than Paypal, please inquire.